She lost her family, her house and most of her land during The Sorrow, but survived the winter years with four fine horses. She moved into the stable and slept beside them on the barn floor, barely able to buy hay. She continued to clean stalls, comb manes and tails, trim their hooves, let them run in the pasture she had left whenever sun seeped through keloided clouds. The horses were hardy but thin. None of her neighbors could help: everyone was struggling to hold on to the little bit of little they had. Some resented a woman who would waste effort serving a crowd of raggedy animals. Many observed their ribs and thought about where to get the best wood for barbecuing horse. She understood their thoughts and smiled. She called on Ellegua, Ogun and Shango, conjured mother-of-pearl light around the horses and blue spheres around their would-be predators, set gris gris and folded white cloth in the four directions. The locals sharpened knives. She set out with the four to see a wise woman she had heard of all her life. “I would love to help,” the wise woman told her, “but, you see, there’s nothing here I can offer you except this red bucket.” The bucket looked older than the ancient woman, but more than that, it was completely empty. The sage lived on water and the small bowl of rice, plantain or foufou that appeared on the table daily, which she offered to share. The horsewoman smiled and thanked her, and led the ponies home. Along the way there was spring grass, and water from newly melted snow in the streams. When people saw the pathetic bucket back at the woman’s barn, they thought the sage had played a sad joke on their neighbor, or maybe one was crazy as the other. The elder had a reputation for generosity and wisdom, yet there it was: a worthless, splintering bucket. Something shifted. The neighbors retired their blades with a puzzled sigh that skipped from one end of the settlement to the other. They began to fill the bucket. A few handfuls of oats, some salt. Piles of hay. Sacks of sweet feed. The horses soon ran sleek, and bedded on fresh shavings. They bucked for happiness because it was morning, and because it was afternoon, for nightfall, and the full moon. They nuzzled bone-tired shoulders and hands, whinnied at familiar faces and stood quiet alongside those in need of healing. The horses comforted everyone who came to the stable. They poked their heads down and played with dogs. They pointed their ears at deer and bobcat, foraged milk thistle, snorted warnings and quickened at the scent of nearby bear and mountain lion. Through the horses’ eyes people saw the freshness of places they had been but not seen their whole lives. They reminded the people of rivers and clean air. Sometimes, when the horses loped across the pasture, the neighbors saw their wings. They spun time. 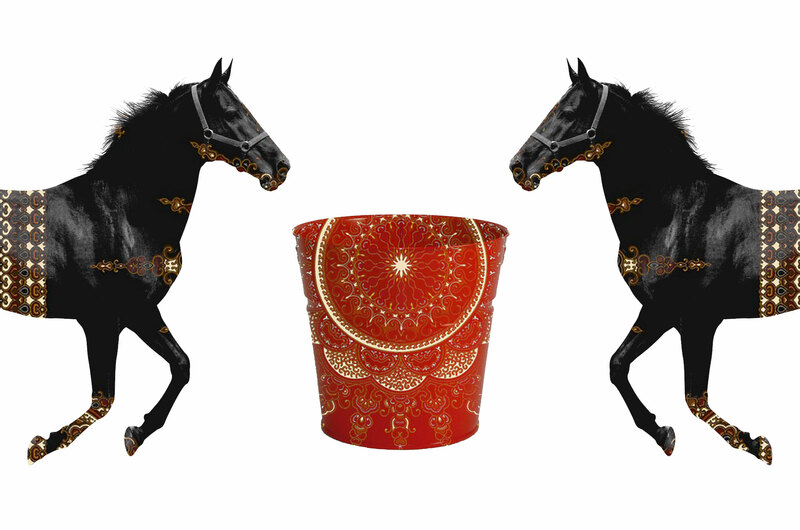 Every day, when the woman brought the red bucket, heads peered over stall doors and fences, alert eyes wide and soft. Everyone grasped what the red bucket held. I tell this ancient story because horses are a remedy. Without the presence of unencumbered animal life on the planet, we will never find wellbeing as humans. My devotion to the people I love binds us forever, but I need animals. Not only do they offer grace and balance, but without their gifts I, as a black woman, couldn’t survive well. Water levels rise, pandemics finish what oil wars start, financial empires crash, privately contracted drones police borders and refugees, and superstorms like Oya and Kali pummel entire continents. Animals hold certain qualities of memory and emotion that humans have renounced. We ground through their presence. For many, it’s plainly impossible that an “inner city” woman seeks the company of horses and finds renewal in the realm of dirt, sweat, trees, sky, water and untamed animals. Yet I am an urban Black person rooted in nature. My great aunt, great grandmother and my mother made sure that came first before all else. They taught me about tides and grunion hunting at midnight, hiking mountain trails, where to pick dandelion greens, reading tea leaves and making up jokes, hand-feeding scrub jays, how to cure ringworm with a penny soaked overnight in vinegar, and how to talk about those who shall be Nameless. They kept horses, mules, goats and donkeys in the backwoods of Tennessee, in Georgia, in Alabama, and in Haiti. I reserve the right to speak with all my ancestors. I am a daughter of Oshun and the family of Orishas. I claim Bridgett Mason, Ida B. Wells, Frances Harper, Mary Ellen Pleasant, Edmonia Lewis, Harriet Tubman, Bose Ikard, Mary Fields, Bill Pickett, Nat Love, Nanny of the Maroons, Chief Joseph, Zitkala-Ša and all the unnamed and forgotten. I am African American and Menominee, among other lineages, and I have a certain inheritance of nomadic horizons. I am from Khemet, Kush, Timbuktu, the Yoruba, Kikongo, Mamaceqtaw, Lascaux and El Pueblo de La Reina de Los Angeles. I am telling it this way: horses are a healing and a calling. They lead by a vibration that pulls us to places unreachable by any other path. These beings are my relations, not a random pastime. The two I care for are mustangs. They’re nothing fancy, have no pedigrees or papers. They’re mixbloods, like me. They live in the wild in-betweens, and many consider them worthless leftovers. My sister died of cancer at the age of fifty-nine, after four years’ deterioration. She was a non-smoker diagnosed with lung cancer about a week after we buried our dad, who also died of cancer after waging years of silent war. He was seventy. In the time since, my other sister, ten years younger, died of liver cancer. My mom died of stress, diabetes and heart failure at age fifty-nine. They were not old. When I turned fifty, it occurred to me that I should do as much living as possible. There was a sinkhole in the pit of my stomach, while Death was sitting off in the corner smoking unfiltered cigarettes and synchronizing watches. A B-movie cowboy named Crash Corrigan put me on a palomino when I was under a year old. That moment is indelible. But, at the time my family began to be stalked by cancer, I hadn’t been around horses for twenty years—since working as barn help at a racetrack in college. I had a horse as a kid, back when board was thirty-five dollars a month and the poor white ranch manager’s five-year-old asked, “y’all niggers?” In 2004, owning a horse again was out of the question: I was a recently tenured associate professor, a black feminist, working class woman, and single parent in a mystified academic zone of thickly layered micro and macro-aggressions. I fulfilled the unspoken and explicit expectations of my joint appointment in order to achieve tenure, contracted to two departments that operated in separate political, racial and social universes. I shopped thrift stores for professional clothing, borrowed money to attend the expected academic conferences and to keep the lights and water on, paid for babysitters while I traveled or brought my daughter along by paying for her travel out of pocket. My future promised to be defined by paying off student debt and fending off the toxins of racism, classism, sexism, PTSD and my own bottomless rage over abuses ranging from sexual assault, to domestic violence, to racial assault in my workplace. Horses command awareness. They are incapable of dissembling. Drift into distraction, forget to attend to where you are and what is happening in your surroundings and in yourself, and there will inevitably be grave results. Anything can happen at any moment, through no particular intention of theirs for good or ill. They are prey animals, guided by the drive to live. This demand to be present in the moment is the inherent risk of interaction. I watered and planted my desert of suburban and urban drought with the idea of what makes me happy, even when it was apparent to me there was no reason to expect, realistically, that I would ever be near an actual horse again. My never-used thrift store riding boots sat in the closet for ten years before it occurred to me I might be in a position to go near a barn. Five dollars. Brand new. My size. There was no reason for me to try them on, much less make that purchase. I knew, though it took years to reclaim clarity about it, that horses were my curative. I began practicing meditation, and to please my own idiosyncratic imagination, I included images of horses in my surroundings. I aimlessly browsed ads. This led me to the breakthrough moment of finding and recognizing Tango from a poem I’d written eighteen years earlier, the being who carried my daughter’s spirit to me. It dawned on me that this dun horse coming into my awareness could be possible. A way presented itself and one by one each door opened. I drove down to the junkyard where the horse dealer had Tango penned. He was one step from the slaughterhouse and needed care. An affordable space opened at a friend’s ranch; one more horse among her buffalo, llamas, burros, pigs, cats, birds and dogs was barely noticeable. That dun horse with the primal buckskin markings, in a split second, brought me back to myself, and unfailingly steadies my journey. Then came the bay mustang, Two Socks. He loves white peaches, playing tag and rolling in muddy water. The cowboy who adopted him wild from a BLM roundup named him after a fictional wolf who died of love and trusting humans. The cowboy was kind but couldn’t keep Soxi, so he gave him to me. Two Socks has seen more freedom and manmade violence than most of us will ever know, yet remains kind toward humans. He was hunted from the air by helicopter, yet has walked next to one while helping rescue an injured woman; his scarred body bears witness to barbwire and a shotgun blast to the face, neck and shoulder from someone who likely thought they were defending civilization from vermin competing for cattle turf. Rounded up as a five-year-old, Two Socks, permanently numbered by a red-hot six-by-four-inch branding iron at the hip and a barcoded freeze brand serial number above the withers, was transferred from his band into human ownership while his herd was similarly dispersed or butchered. A feral horse with caramel colored eyes, his calm resides in memories that evade capture. He stood in the rain with his mother, slept under open sky curled into her soft flank. Mustangs know what it is to come and go at will, to survive without dependence on human whim. Once domesticated, but roaming for generations, mustangs eke out lives in borderlands and abandoned places. In the roundups, they’re corralled, then shipped out packed on trucks, bound to become pet food, hamburger, or fertilizer, or placed for adoption to follow wherever that road leads. If they’re lucky they’ll be turned out again on open range and left alone. Two Socks put his head on my shoulder and napped the afternoon we met. Two Socks quickly taught me how souls artfully accompany each other through many lifetimes. He arrived when I needed him most, joining me to the ancestral feeling of risking levitation, flight of bone, muscle and blood, and the aim to live down to the marrow of it all. Like the lotus, Xochitl is rooted deep, ever unfolding. The lotus rises above attachment and desire. Xochitl calls forth delicate petals, coaxes flowers from blasted seeds. Like the lotus, my horse is, seen and unseen, watery, a compassionate trickster outwitting death. He is nahui, spirit guide and healer. Sometimes, we just know something because we feel it, in the space of a breath, past logic and reason. If not for the horses, I would have dissolved into a million pieces, blowing across asphalt inert as soot. They drummed peace into my pulse. Love your happiness, even in the midst of struggle. My bliss is in the rhythm of hoof beats, the eloquence of equine movement and the horse’s instinctive priorities, their resilience, their trust. The Anasazi hooves of my spirit guides drum the primordial sound. In love with their own speed and stillness, they become gifts. They shuffle dance to lunar chants and cross dimensions. They graze among lava stones, gallop at the crests of tides. They savor lavender, rose geranium, cardamom and jasmine. Meteor showers trill their evening migrations, steps mapped by glowworms like miniature fallen stars. I smudge their fringed locks with sage and sweetgrass, rub dried flowers over their heads, honor their stories. We walk together. They are a medicine, their steps each one a prayer for the planet. The horses stride rocky paths and sand dunes with equal certainty. Three ghost coyotes pass single-file between worlds, veiled souls in grey-black mist. Valorie Thomas (@valoriedthomas) is an LA native with roots in Chicago, Tennessee, Georgia, and Haiti, and is an Associate Professor of English and Africana Studies at Pomona College. Her interests include the Black West, indigenous spirituality, African Diasporic Vertigo and Afrofuturism.